I can’t believe this is still happening on such a scale – it seems around $50 billion worth of gas was wasted last year through flaring. When crude oil is extracted, sometimes very large amounts of natural gas accompany it. If the infrastructure isn’t in place to capture this, this gas is burned as waste. 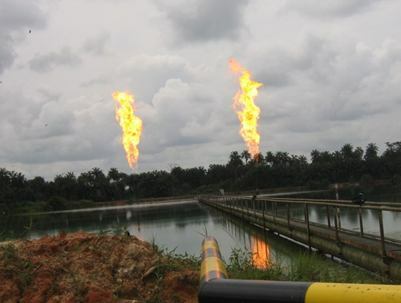 While substantial inroads have been made in reducing gas flaring in some parts of the world, according to the World Bank, 140 *billion* cubic meters of the stuff was flared last year. That is far more than all of Canada or the UK uses in a year for residential * and* commercial consumption! A single cubic meter of combusted natural gas generates around 1.8kg of carbon emissions. That works out to 252 million tonnes of carbon emissions from the gas that was flared in 2011. In addition to carbon dioxide, other emissions include sulfur dioxide, nitrous oxides and carbon monoxide. While not as bad as coal with regard to any of the above, natural gas isn’t as green as the industry would have us believe. This ‘waste’ gas, as well as being an energy source we’re frittering away, is a toxic product and should be treated as such. It’s the equivalent of allowing factories to spew toxic sludge into waterways. Flaring certainly isn’t confined to developing nations and not all countries are reining in the practice. According to an article on The Guardian, The USA – which is currently the 5th largest flarer globally – actually increased the amount of flaring by nearly 50 percent in 2010-2011. The chair of Friends of the Earth International has called flaring a crime against humanity – and I don’t feel that is an exaggeration. Future generations will look back on this and ask “what were they thinking?” We need to increase pressure for greater efforts to stop to this horrible waste and unnecessary additional pollution.